Armando Iannucci at the Los Angeles premiere of The Death of Stalin. 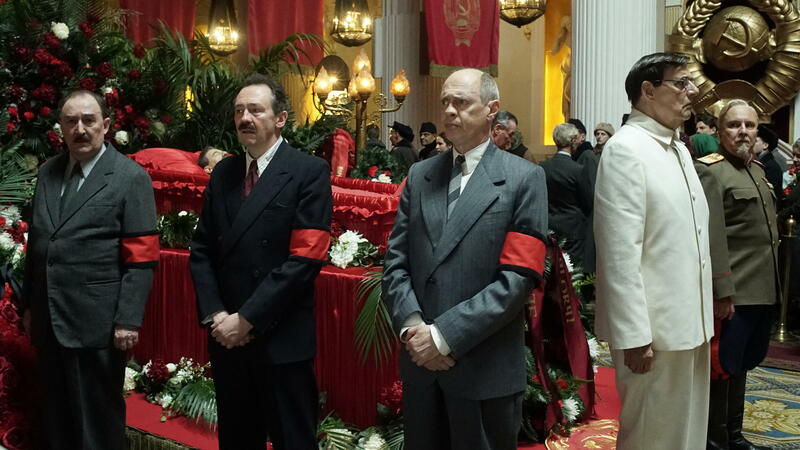 Flunkies of the late Soviet dictator Joseph Stalin jockey for power in Armando Iannucci's new film The Death of Stalin. Julia Louis-Dreyfus as the gaffe-prone Selina Meyer in Veep. Iannucci's modus operandi has always been mocking pompous, powerful people and the nincompoops who surround them. "If something awkward is happening, my instinct is to make fun of it," he says, which is exactly what happens in his new film. Stalin falls lifeless, while his cowering underlings are goofing off. They rush to his side, then jostle for power, accusing one another of "twittering like fishwives at the market." Actor Michael Palin, who plays Stalin loyalist Vyacheslav Molotov, is a longtime fan of Iannucci. "He loves to see the mania and mayhem in people," Palin says. "Especially people in power. You know, the kind of energy directed in completely the wrong direction. He's very very good at that." Palin was one of the founding members of comedy troupe Monty Python, and he says Iannucci's style is very much in the Python tradition. "We've always been fairly ruthless with our leaders and anyone who, in Britain, who tries to hang on to power — usually there will be a protest, and we don't like people becoming too full of themselves. The way to diffuse pomposity and power is through ridicule, which is part of British humor." Iannucci's productions poke fun at inept politicians and dysfunctional bureaucracies. The director says he finds the fact that we're all fallible to be both endearing and horrifying. "I think we place the art of politics on this pedestal," he says. "And we assume that it's done by people who know what they're doing. And I just want to show that that's not the case. It's all seat of the pants, off the cuff, try and think of something good to say today, or how do we get 'round the mistake from yesterday, hoping that you're not found out." That's the blueprint for another Iannucci creation: The award-winning HBO series Veep, which stars Julia Louis-Dreyfus as Selina Meyer, the vice president — and briefly, president — of the United States. She makes many gaffes — unintentionally wearing squeaky shoes, having to vamp nonsensical speeches, and endlessly dealing with fools. "With Veep, I wanted to feel almost like we're an uninvited guest seeing what goes on," Iannucci says. "So I encourage people to talk over each other and not do all the cues beautifully rehearsed." He says he also used this signature technique for his 2009 film about British politics, In the Loop. "I always do a take when I tell the camera operators to not film anyone talking, just film people listening. Because sometimes, the way somebody just reacts, in shock or horror, or laughs, is actually the funny bit of the routine, as it were." Actress Anna Chlumsky is in Veep and was in In the Loop. "He'll just like shoot double what he needs, you know, and then only about half of it ends up in the edit," she says. "And really what that allows you do is just play, play, play, and not censor yourself and not feel judged." She says Iannucci loves to put his actors in uncomfortable situations. "Arm loves to put, like, a short person and a tall person in the scene together. He loves grown people running. He likes to put people in small spaces." Iannucci lampoons not just politicians, but spin doctors and TV news hosts. In 2005, he created the political sitcom, The Thick of It, which became a cult hit for the BBC and was spun off into In the Loop. He also created beloved TV and radio presenter Alan Partridge, a self-obsessed buffoon played by Steve Coogan. Over the decades, the character has evolved — or devolved — across TV shows and movies like 2013's Alan Partridge: Alpha Papa (which contains a memorable moment where Partridge calls Neil Diamond the "King of the Jews"). Iannucci grew up in Scotland, where he got his start doing standup comedy at school talent shows. "I was about 12, or 13, and I'd just steal jokes off the radio, off radio comedy shows." His career took off on the BBC's Radio Scotland. "It was sketches, and I was doing all the voices. So I was presenting a music show, but I was allowed to write comedy, and then actually direct some performers, and use sound effects, and edit it." Iannucci says he learned a lot from working in radio — about using words deliberately and sparingly. He was also influenced by English poet John Milton; In graduate school, he even began writing his Ph.D. thesis on Milton's epic Paradise Lost. "The character you really like is Satan. God is a bit boring. And clearly Milton is enjoying writing Satan. His Satan is sort of a politician. He uses words to convince all his followers that the state they're in is the opposite of how it is. Because they're in hell. And he's trying to convince them that this will be fine, don't worry, I can turn this around — that's just using rhetoric to pull the wool over people's eyes." In The Death of Stalin, Iannucci mixes comedy and tragedy. He says the film's underlying level of anxiety may have a resonance for today's audiences — though he started making the movie a year before Donald Trump became president. "People have commented on the fact that it's strangely prescient, because it's about people who want to control the media, the flow of information. There are mentions in it about things like 'a new narrative, and an old narrative,' which brings in the whole business of alternative facts and fake news." But, he says, despite his penchant for satire, he's actually quite sympathetic to politicians who end up compromising their beliefs in order to succeed. "That's why I could never be a politician. I wouldn't last for a second. I'd end up just saying the wrong thing. Or if an opponent said something, I would say, 'You know, you put it like that, I think that's a good point actually.' "
Iannucci's next film will take on David Copperfield — the Dickens novel, not the magician. Armando Iannucci has created some of the most biting political satire on radio, TV and in the movies of the past 25 years. His latest is a political spoof about the demise of dictator Joseph Stalin in 1953. SIMON RUSSELL BEALE: (As Lavrentiy Beria) Stalin's dead. STEVE BUSCEMI: (As Nikita Khrushchev, yelling) Stalin is dead. MARTIN: "The Death Of Stalin" hits theaters this weekend. NPR's Mandalit del Barco gives us an inside look at Iannucci and what is funny about fascism. MANDALIT DEL BARCO, BYLINE: Armando Iannucci's MO is to mock pompous, powerful people and the nincompoops who surround them. ARMANDO IANNUCCI: If something awkward is happening, my instinct is to make fun of it. DEL BARCO: Which is what happens in his new film. ADRIAN MCLOUGHLIN: (As Joseph Stalin, laughing, choking). DEL BARCO: Stalin falls lifeless while his cowering underlings are goofing off. BUSCEMI: (As Nikita Khrushchev) No, no, come on. BUSCEMI: (As Nikita Khrushchev) No, not again. DEL BARCO: They rush to his side, then jostle for power. BUSCEMI: (As Nikita Khrushchev) All right, can we just stop twittering like fishwives at the market and concentrate? UNIDENTIFIED ACTORS: (As characters) Whoa, whoa, whoa, whoa, whoa, whoa. MICHAEL PALIN: He loves to see the mania and mayhem in people, especially people in power. DEL BARCO: Actor Michael Palin is a longtime fan of Iannucci. PALIN: You know, the kind of energy directed in completely the wrong direction - he's very, very good at that. DEL BARCO: In this film, Palin stars as Molotov, one of Stalin's loyalists. The actor says Iannucci follows in the tradition of the Monty Python style Palin helped create. PALIN: We've always been fairly ruthless with our leaders and anyone in Britain who tries to hang on to power. Usually, there will be a protest. And we don't like people becoming too full of themselves. The way to diffuse pomposity and power is through ridicule, which is part of British humor. DEL BARCO: Iannucci's productions poke fun at inept politicians and dysfunctional bureaucracies. The director says he finds the fact that we're all fallible to be endearing and horrifying. IANNUCCI: I think we place the art of politics on this pedestal, and we assume that it's done by people who know what they're doing. And I just want to show that that's not the case. It's all seat-of-the-pants, off-the-cuff, try and think of something good to say today, or how do we get round the mistake from yesterday, hoping that you're not found out. DEL BARCO: That's the blueprint for another Iannucci creation, the award-winning HBO series "Veep." 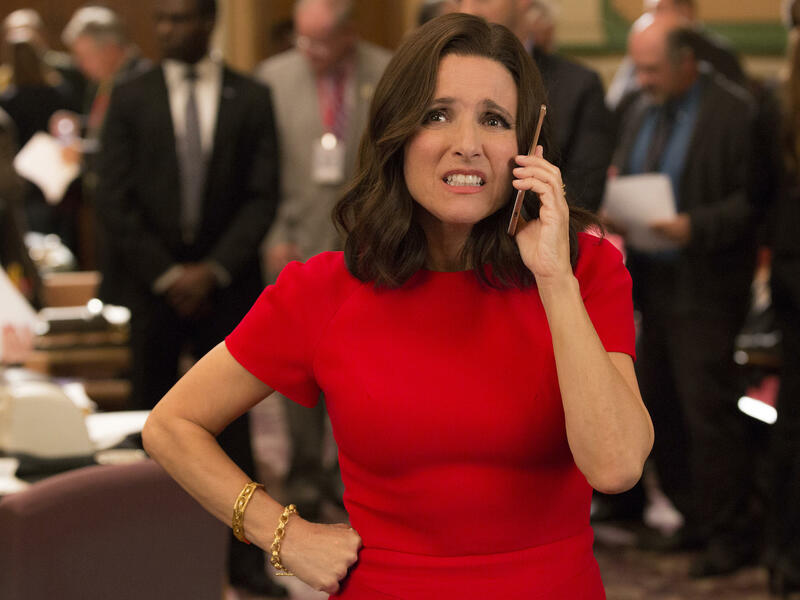 DEL BARCO: Julia Louis-Dreyfus stars as Selina Meyer, the vice president and briefly president of the United States. She makes many gaffes - unintentionally wearing squeaky shoes, having to vamp nonsensical speeches and endlessly dealing with fools. KEVIN DUNN: (As Ben Cafferty) So are you ready for these buzz-cut bozos? JULIA LOUIS-DREYFUS: (As Selina Meyer) What are you talking about? I'm used to dealing with angry, aggressive, dysfunctional men - i.e., men. IANNUCCI: With "Veep," I want it to feel almost like we're an uninvited guest seeing what goes on. So I encourage people to talk over each other and not do all the cues beautifully rehearsed. DEL BARCO: Iannucci says he also used his signature technique for his 2009 film about British politics, "In The Loop." IANNUCCI: I always do a take when I tell the camera operators to not film anyone talking, just film people listening because sometimes the way somebody just reacts in shock or horror or laughs is actually the funny bit of the routine, as it were. DEL BARCO: Actress Anna Chlumsky is in "Veep" and was in "In The Loop." ANNA CHLUMSKY: He'll just, like, shoot double what he needs. You know, and then only about half of it ends up in the edit. And really, what that allows you to do is just play, play, play and not censor yourself and not feel judged. DEL BARCO: She says Iannucci loves to put his actors in uncomfortable situations. CHLUMSKY: Arm loves to put, like, a short person and a tall person in a scene together. He loves grown people running. He likes to put people in small spaces (laughter). DEL BARCO: Iannucci lampoons not just politicians but spin doctors and TV news hosts. In 2005, he created the BBC Four political sitcom "The Thick Of It," which became a cult hit and was spun off into "In The Loop." Iannucci also created the beloved TV and radio presenter Alan Partridge, a self-obsessed buffoon played by Steve Coogan. Over the decades, the character has evolved - or devolved - across TV shows and movies, like here in 2013's "Alan Partridge: Alpha Papa." STEVE COOGAN: (As Alan Partridge) That was a majestic voice. You can keep Jesus. As far as I'm concerned, Neil Diamond will always be King of the Jews. And this was "Mid Morning Matters." DEL BARCO: Iannucci grew up in Scotland, where he got his start doing stand-up comedy at school talent shows. IANNUCCI: And I was about 12 or 13. I'd just steal jokes off the radio, off radio comedy shows. DEL BARCO: His career took off at the BBC's Radio Scotland. IANNUCCI: It was sketches, yeah, and I was doing all the voices, you know. So I was presenting a music show, but I was allowed to write comedy, and then actually direct some performers, and use sound effects and edit it. DEL BARCO: Here he is in 1993 on BBC Radio 1's "The Armando Iannucci Show." IANNUCCI: Yeah, hi, fabu, and sit down. This is Armando Iannucci here with 30 minutes of twisted wireless excitement. Anything you ever heard on Radio 1 over the past five years is about to be put through a blender and restitched together the wrong way around. Most of the jingles come off some dodgy cassettes bought down at the market. DEL BARCO: Iannucci says he learned a lot from working in radio about using words deliberately and sparingly. He was also influenced by English poet John Milton. In graduate school, he even began writing his Ph.D. thesis on Milton's epic "Paradise Lost." IANNUCCI: The character you really like is Satan. God is a bit boring. And clearly, Milton is enjoying writing Satan. His Satan is sort of a politician. He uses words to convince all his followers that the state they're in the opposite of how it is because they're in hell, and he's trying to convince them that this'll be fine; don't worry; I can turn this around. That's just using rhetoric to pull the wool over people's eyes. 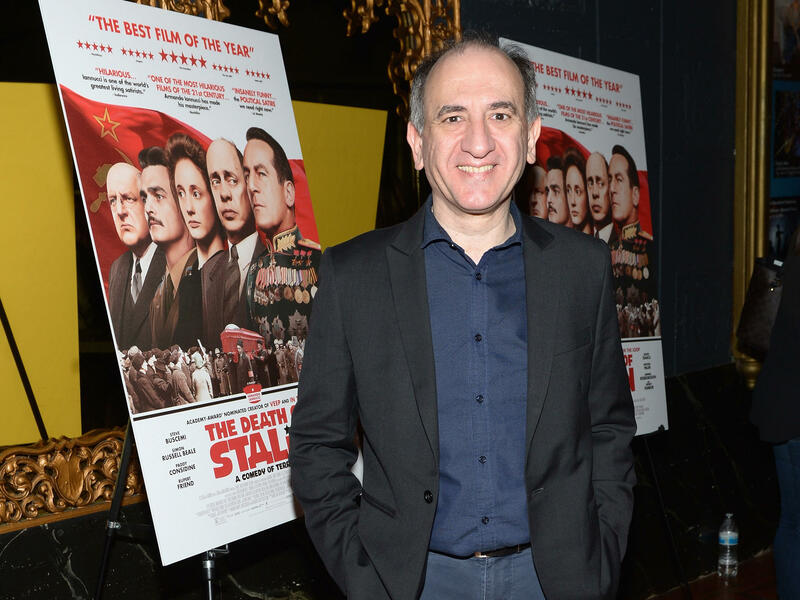 DEL BARCO: In "The Death Of Stalin," Iannucci mixes comedy and tragedy. He says the film's underlying level of anxiety may have a ring to it for today's audiences. He says he started making the movie a year before Donald Trump became president. IANNUCCI: People have commented on the fact that it's strangely prescient because it's about people who want to control the media, the flow of information. There are mentions in it of things like the - a new narrative and an old narrative, which brings in the whole business of alternative facts and fake news. DEL BARCO: Iannucci says despite his satire, he's actually quite sympathetic to politicians who end up compromising their beliefs in order to succeed. IANNUCCI: That's why I could never be a politician. I wouldn't last for a second. I'd end up just saying the wrong thing, or if an opponent said something, I would say, you know, you put it like that, I can - I think that's a good point, actually. DEL BARCO: Iannucci's next film will take on "David Copperfield" - the Dickens novel, not the magician. Mandalit del Barco, NPR News. (SOUNDBITE OF RAYA BRASS BAND'S "UNIFY") Transcript provided by NPR, Copyright NPR.